We have our Halloween pet costumes all ready to go. PetSmart sent us a variety of Halloween goodies including pet costumes and toys. All opinions are our own. Pet costumes for Halloween are just so fun. We love to dress our guys up, and if it were up to me, they would be in some sort of costume all year round. 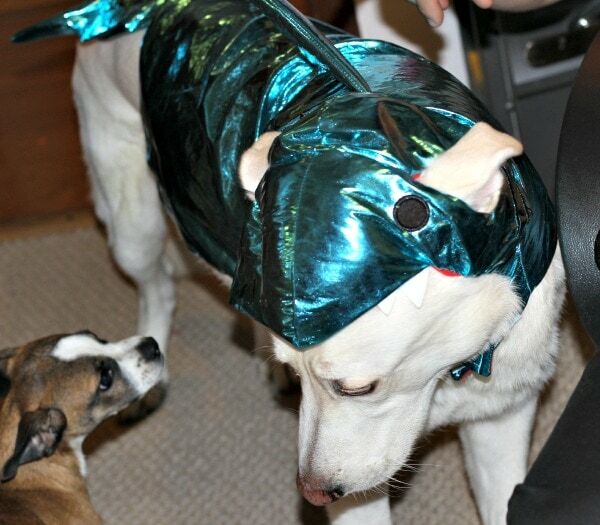 PetSmart surprised us with the costumes they sent, so I was pretty shocked when Hilo received a shark costume. I have a slight obsession with sharks, so it was so perfect. 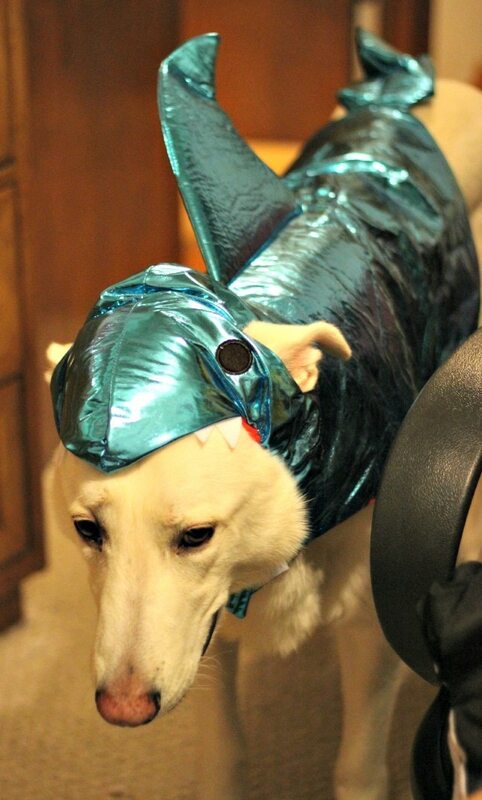 Our great white shepherd was definitely the best sport when it came to playing dress up. Our little guys on the other hand, aren’t huge fans of playing dress up. Actually, I can never tell if the Grump hates it, or just gets so excited that he goes a little nuts. After we put his pumpkin shirt on, he ran and bounced around the room like a maniac. He even activated the lights on the shirt by himself. His reaction made us think he was angry, but then when we took it off, he kept barking to have it put back on! Franklin is the newest to this tradition, as this is his first Halloween. 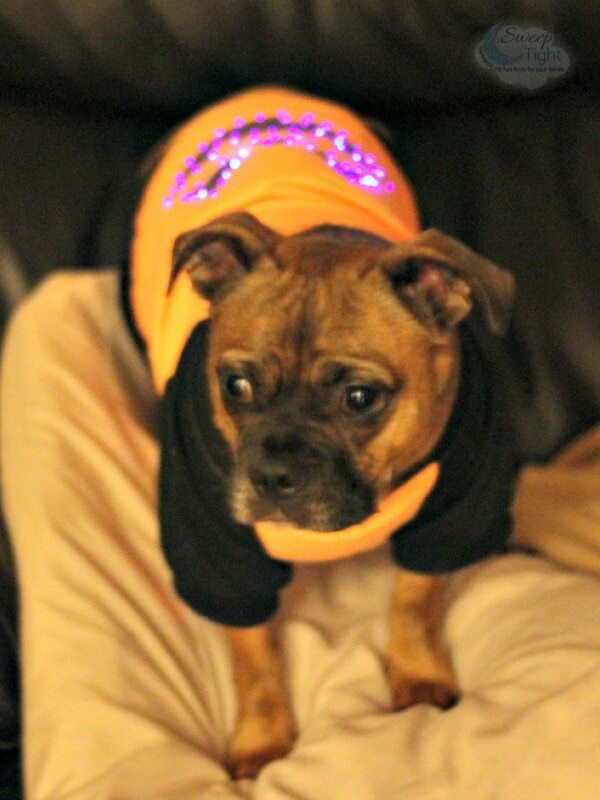 He also has a light up costume that will keep him a little warm while looking like the most adorable punk zombie. I’ll tell you one thing, I sure do have a whole new appreciation for animal photographers. Getting these guys to stay still for photos is nearly impossible, especially for something as exciting as dressing up. As always, PetSmart has quality items at affordable prices. We are always pleased with our products from them. We had a blast trying on the pet costumes and are looking forward to dressing them up for Halloween. If you come trick-or-treating at our house, be prepared for a parade of our furry crew in funny costumes! Do you dress your pets up for Halloween? If so, what are they being this year? How cute! Why not include your doggies in the Halloween fun, they are family too! I hope a lot of people dress up their pets this, and every Halloween! Thanks for sharing! The dogs all look cute in their outfits. I like the Shark outfit! It is so stylish. All your dogs look adorable! Awww. We’ve dressed our pets up in the past but nothing as cool as these. I love the punk rocker! Oh goodness! I’m calling my daughter downstairs right now – she’ll flip over these dog costumes!!!! Too cute, I love the shark costume. I agree with you, getting good pet pictures is hard, because they are not cooperative. Your dogs are cracking me up! Our dog, Nellie, was the Devil Dog, last year. During the summer, she had a boo-boo on her tummy and would lick it. Instead of wearing the “cone of punishment” from the vet, it was easier to have her wear a costume shirt. 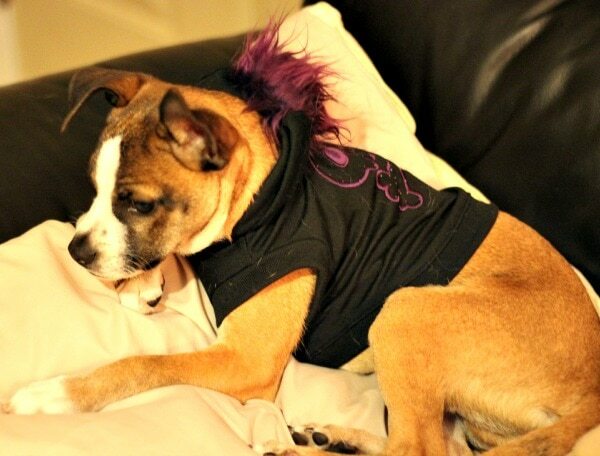 She has a “Bad to the Bone” shirt that we love. She can also wear my daughter’s too small shirts, so this year she has a Harvard t-shirt she’s wearing for Halloween. She’s a “Harvard Yard Dog” – get it? As long as the costume isn’t too tight, she’s actually very keen on wearing the shirt. She’s a good dog. I love pet costumes! I went to Pet Smart and got the shark one for our grouchy old man chihuahua. It is so funny looking on him, but he is going to wear it all winter for a coat too! Oh wow… I can’t get past the great white Shepard! LOL My big guy is so afraid of costumes, he’d never go for it LOL.. My small dude, all into dressing up! Then he tries to play and lay down next to the big baby… it’s so funny to watch. Those are some cute costumes. I like to dress my dogs up too but they are not big fans either. I plan on dressing up one of my dogs this year with a costume from Petsmart! What fun costumes. Your pictures are great – I know how hard it is to capture animals in photos.